If you want to send a window to another desktop, all you have to do is right-click on the title bar, select 'To desktop' and select one. This is all right if you just want to send a window somewhere else but what if you want it to go somewhere specific? All you are presented with is a list of desktop numbers which isn't necessarily a great deal of use. So, what can we do about it? If you right-click on the desktop, you should get a menu similar to the one on the right - depending upon which version of KDE you are using. Click on 'Configure Desktop...'. Next, select 'Multiple Desktops' and then make sure that you have selected the number that you want to have. Now, you can organise your desktops as well as you want. I have 10 on my general account and usually have mine displayed as two rows so I tend to use the left half of these (1, 2, 3, 6, 7 and 8) for work, the bottom right one (10) for email and the others for anything else. So, I have given them the names you can see on the right. Now, when I right-click on the title bar of a window so that I can send it to a desktop, I get a menu with meaningful names. On the Pager itself, you can see the desktop numbers. To me, they have established roles to play so I personally don't use their names here but if you do want them to display their names instead (you did choose short names didn't you?) you can make it do that as well. Right-click on the Pager and then select 'Show', 'Name' for it to display the names. Alternatively, you can configure the panel so that it produces tool-tips - including the Pager. 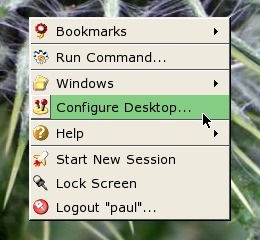 To do this, right-click on the panel or a panel icon and select 'Panel menu', 'Configure Panel...'. 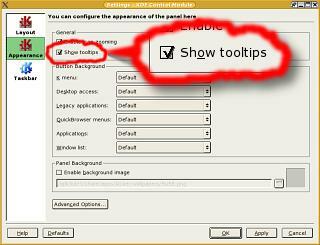 Next, click on Appearance and then make sure that the Show tooltips checkbox is checked. And there you have it. The desktops in the Pager are reasonably small, you can see which desktop is being pointed at but also see the name in the tool tip. Most people will know that if you have a list box such as the one on the right, you can usually select more than one item in it simply by holding down [Ctrl] when clicking the mouse on another item. However, did you know that you can select multiple pieces of text by doing the same thing? Here, we see OpenOffice.org's cross-platform word processor with a number of pieces of text highlighted in exactly the same way. Text is highlighted by dragging the mouse across it - releasing it when the other end of the piece of text has been reached - and then, when further pieces of text are required this action is repeated only this time, whilst holding the [Ctrl] key throughout the action. This works the same across platforms. 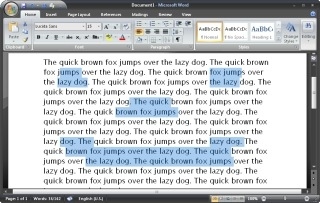 On the right, you can see the result of doing exactly the same thing but in Microsoft's Office 2007 word processor 'Word for Windows' running on Windows Vista. Note however that in this case, where a drag operation has started and transcended across to another word, the word in which the drag operation started has been selected entirely, regardless of whether or not it was to start with. 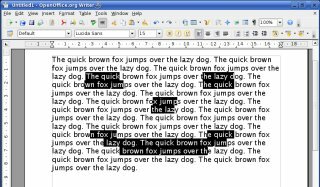 This bug/feature does not happen in OpenOffice.org's word processor so, there you are free to format parts of words within multiple, multi-word selection operations. Save the whole session to a special file on the hard drive and shut down - this has the advantage that it stops all power usage. Just switching off the monitor and hard drives is not particularly green as the computer still needs to use power to keep the session alive and if you have a power cut, you are in trouble. However, saving to disc does take a bit of time although not that much. So, what are the options and how is the performance? Windows Vista allows you to 'Sleep' (just turn off the drives and the monitor) or 'Hibernate' (save and power off). This is the tool-tip for Hibernate. Click on it and it will lock the session, save the system to the hard drive and power off. When you power-up again, it loads everything the way it was and then you get to log in from the locked screen (so you are still protected by a password or whatever system you have for protection from a locked screen. This is it in Linux (KDE). You only get to 'Suspend' the system - this is the same as Windows' 'Hibernate'. Just putting the system into sleep mode is not really very good for the environment so it is not included here (I'm not going to comment on Windows being a US OS and the Kyoto agreement along with Linux being non-US and more environmentally aware). Basically, it does the same but this time into its swap partition. In both OSes, you can leave the machine off for any amount of time or even takes disks out and run other OSes between sessions - I have, and it works exactly how you would expect it to. So, how quick is it? These were done on the same machine and both include the BIOS logon although the Linux time also includes GRUB OS selection as that was done on a disk with two OSes on it whereas the Windows Vista Beta 2 disk is dedicated to Windows (it needs to be as it takes up well over twice the disk space as the Linux OS with the equivalent set of programs). Remember that any programs that were online or had shares in other network resources will have undergone time travel as far as they are concerned. This is a bit like the associated artefacts of the 'twins paradox' - not the paradox itself as that is fairly easy to understand, just the victim of the paradox trying to get to grips with the things that have changed while it was not experiencing time in the same way that the rest of the computer's resources were. 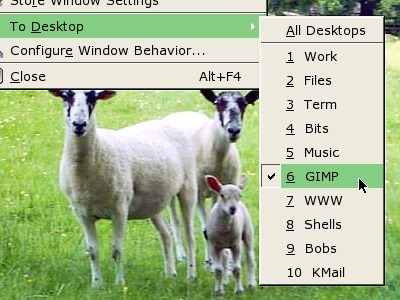 Windows XP's GUI is notorious for being rather on the large side and, as a result, there isn't a lot of space left on the desktop for your programs. You can see in the screenshot on the right how big just the title bar is in relation to the useful part of the display (ie, the contents of each window). So, how do we go about changing this? Right-click on the desktop and select 'Properties'. In the 'Properties' dialogue box, under the 'Appearance' tab, click on 'Advanced'. In the 'Advanced Appearance' dialogue box, click on the 'Item:' list box and select 'Active Title Bar' (or just click on a title bar in the diagram) and then reduce the font size, possibly to '8' (or whatever you want). Then reduce the size of the window to as small as it will go for that size of font. If it is not small enough, you can make the font smaller. Click on 'OK' and 'OK' again. Now you can see how much smaller the window decorations are. You can now see much more of the contents of the windows (which is why you bought the OS in the first place). The same thing should work in Windows Vista so, even though this is a beta, let's have a go. When we right-click on the desktop, the first thing that we notice is that there is no properties entry in the drop-down menu. Instead, we have to select 'Personalize' (yes, with a 'z'). Next, click on 'Visual Appearance' [sic]. Then, in the 'Appearance Settings', click on 'Advanced' in the bottom-right. Then, select 'Active Title Bar' and reduce the size of the font and the size of the bar in the same way as you would for XP. This is the result in Vista. 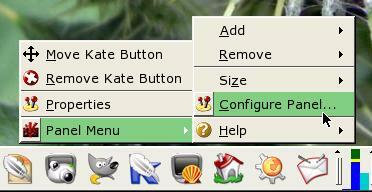 Unlike XP where the icons change size, you are stuck with a large icon size in Vista so there is not much that you can do about reducing the size of the title bar in Vista. Remember though that this is still Beta 2 and there is time for Microsoft to get around to correcting this fault/feature. BZFlag is a network game that can actually be played on many operating systems although it is preferred that the game is played on a non-proprietary OS. The idea is that there are several types of game of which free-for-all and hunt the flag are two. These games are played between people all over the world using servers that are logged into when you start playing the game. Being a live game, you need to cut down on any latency and as a result, it doesn't really matter what order packets are received in. So, UDP is the obvious choice for this. As a result, there are many packets travelling both in and out of your network connection with the Internet. But how much traffic does this add up to? If you run KDE System guard, you can monitor the packets going in and out of your network. In the screenshot on the right, blue is travelling out onto the Internet and red is travelling in from it. The top display in each pair is the amount of data in kBytes/second averaged over 2 seconds and the bottom display is the number of packets/second averaged over 2 seconds. You can see that there is hardly any data travelling out, not reaching 1kByte/s and averaging around 4 packets/s and the inbound traffic is 2 to 3 kBytes/s with around 40 packets per second. If you run Ethereal, you can see what is in the packets. On the right, you can see a part of a typical session. Below is part of the screenshot and shows that all of the packets are only 73 bytes long with the destination port of 5158 in this case. As you can see, the data part is not that much of the packet (highlighted in black at the bottom). To get a decent, low-latency game, the ping time needs to be small as well. On the right, you can see a ping to that site with the time being very consistent and only around 32ms. In all, a game like BZFlag does not produce that much traffic and at roughly 13MB/hour, is unlikely to exceed any ISP's quota for traffic. If you've installed Windows Vista Beta 2, you might have found that your hardware isn't recognised by the OS. In 16 colours, many of Vista's controls fail to display properly. Many of the subtle colours that Vista uses come out as the same colour when reduced to 16 colours and so the boundaries and contents of some controls disappear. Examples include: checkboxes; some tabs; and, the window decoration buttons such as close, maximise and so on. As the drivers already work on your hardware under Windows XP, it is probably worth trying to install them on Vista as well. So, open up Windows Explorer and work you way through the labyrinth of directories until you find the one you are looking for and double-click on the 'setup.exe' files that you need and hopefully, they will run and install your drivers. You might find that you need to go into safe mode to do this but almost certainly, you will need to confirm in a dialogue box that you really do want to install a program - I counted 17 times for one driver. At boot-up, you will be offered safe mode as an option (press [F8] and select 'safe mode'). If the program fails, Vista will/probably/might tell you that the installation failed and ask you if you want it to run again using the recommended settings. If this happens, accept the offer. You will of course have to reboot every time you have a go because the GUI driver is part of Windows' monolithic system and not a separate process that can be started or restarted on its own. Eventually, you will get it to work. This is new territory so good luck. ...click on 'Adjust screen resolution'. In the 'Display Settings' dialogue box, click on 'Advanced Settings...'. Click on the resolution and colour depth that you want, click on 'OK' and then on 'Apply'. Windows Vista is supposed to be more network oriented than previous versions although there are a number of things that just haven't changed - such as ftp which is covered below. Vista, when it is eventually released in all of its incarnations, will, no doubt, have had many of the security fixes installed by default. However, SMB (known in the Linux world as 'Samba') will have some limitations put in place to the number of simultaneous SMB peer network connections. In the 'Home Basic' version, you will be permitted to have only five and in the 'Home Premium', 'Business', 'Enterprise' and 'Ultimate', you are allowed to have 10. The problem with this is that I didn't know that there was any limit before reading this (Microsoft's official documentation on Windows Vista) so I tested out some other Windows systems to see if there already existed a similar limit. I did this by creating a number of shares (20 for arguments sake - being well over the 10 that were permitted in Vista) on both Windows 98SE and Windows XP and then opening them all on another machine, so that they all worked simultaneously. Certainly a limit of 5 or 10 shares is a new feature of Vista. On the right, you can see 20 different SMB shares from a Windows 98SE machine displayed in Windows Vista. So, if you want to use Windows for SMB, don't bother to upgrade to Vista unless this limit changes in the mean time. If you still want to upgrade your system, the Linux operating systems run Samba a lot more efficiently than Windows does - estimates clock this at around 4 times faster on Linux. On the right here, you can see 20 different SMB shares from a Windows XP machine displayed in Windows 98SE. As far as we can make out, there is no arbitrary limit to the number of shares in 98SE or XP - certainly, SMB is capable of providing many more shares than the 10 on Vista. The only conclusion is that Microsoft want SMB to be replaced which is a pity because it already works quite well on Windows networks and other operating systems can integrate with Windows resources using Samba - both as client and server. FTP (File Transfer Protocol) has been around for a long time and you can tell this to some extent by the fact that a way of finishing a session is to type 'bye'. As far as post-Win95 PCs are concerned, the Windows FTP client has remained (virtually) unchanged between Windows 98SE and Windows Vista (Microsoft, as of 19th August 2006, it's not too late to update this). One could speculate that they include the command line FTP client so that the 'command line die-hards' will not complain but should really be using some GUI-based program at extra cost instead. Unfortunately, personal computers - whether they are PC, Macs or other platforms - are increasingly network-based and so FTP is more important than ever. As you can see, nothing at all has changed in the list of commands between 98SE and Vista - it is almost as though Microsoft wants command-line-based FTP to go away and die. dir         macdef      pls         runique     ? There is a lot more to it with Linux and the other Unices. However, the basic functionality that we need to put multiple files onto a remote FTP server is in all of the clients. 220 "Welcome to Azure FTP service." Note that the password is not echoed on the screen. However, ftp is not encrypted so it will be passed over the network in the clear (ie, not encrypted). If you want to find out what files are in a subdirectory on the server, you can either type the DOS 'dir' (directory) command or the UNIX 'ls' (list) command. ftp: 439 bytes received in 0.33Seconds 1.33Kbytes/sec. ftp: 47 bytes received in 0.05Seconds 0.94Kbytes/sec. For some reason (I might be accused of being cynical if I were to suggest that Microsoft wants to discourage people from using UNIX commands) the 'ls' command is broken and just gives you a list of names and doesn't differentiate between files and directories. In the Windows client, the 'dir' command gives the same results that the 'ls' and dir' commands both do in the UNIX FTP client. This broken FTP client was broken back in Windows 98SE (and probably before) and yet Microsoft has never bothered to fix it so Windows users (or perhaps more importantly, the users of other OSes using the Windows FTP client) are stuck with only one directory listing command. ftp: 567 bytes received in 0.27Seconds 2.10Kbytes/sec. This is the same listing that you get if you type 'ls -l' at the console prompt (UNIX - you don't get this on Windows with a command-prompt 'dir' command). As you can see, there are several columns and most of the time, you will only be interested in the first letter of the first column and the content of the last column. The first character of the first column tells you whether or not it is a directory - the other characters telling you which permissions are set for the file or directory. For files, you should see at least '-rw-' at the beginning, possibly '-rwx' - the 'x' meaning that it is executable although the only place you should see this if you are FTPing to a web server is if you are looking around the cgi-bin directory or any subdirectories of that. For directories, you should see 'drwx' at the beginning, meaning that: 'd' - it is a directory; and, 'rwx' - that you can read, write and enter the directory. After that, there is a number that is usually 1 for a file (although it can be more than one) and more than 2 for a directory that has some content. Following that, you have the UserID and GroupID for the owner of the file - sometimes as numbers, sometimes as names. Next you have the length (if you look at a directory on a UNIX system, these sizes should be pretty small unless there are a lot of files in there). Next, you have the date and finally, the name of the file/directory. The first one uses the absolute path and the second one uses the path that is relative to where we currently are. mdelete would then ask you to confirm each delete operation. However, mdelete will expand the wildcards as much as it can and if you wanted to delete files using the following pattern - '*pic.png' - then it would expand the initial asterisk to include '../*pic.png', '../abc/*pic.png' and so on. So, make sure that you include a non-wildcard character at the beginning of the string if you can. In the same way that we can put a single file using the 'put' command, we can also transfer multiple files using the 'mput' command. This is done in the same way that we used mdelete. Like mdelete - where a set of files already exists that can be parsed with a regular expression - mput has available to it a set of files that it can parse with a regular expression. or 'a really neat way of doing this'. Supposing you have a number of files to transfer from a number of subdirectories and you want to preserve the directory structure. For example, the structure on the right. Unfortunately, at the moment, there is no 'rput' (recursive put) in the normal ftp clients (although there are commercial versions). So, is there a simple way to do it using a normal browser in a GUI? ...you will be able to log on and see the contents (you will probably have seen your browser do this with anonymous ftp sites any way). Once you have logged on, you will see in the address bar 'ftp://[account name]@[domain name]/ like so (although here, I have moved up into a directory called 'public_html'). In the directory pane, you should now see file listings and if you have a 'tree' view, you should be able to expand any of these directories. Now, open up a file browser window and go to the root directory of the files you want to upload (ie, /home/paul/files/some_directory_or_other'). Next, highlight any files or directories you want to upload but only those that are in the root - ie, don't highlight any files or directories that are in its subdirectories - as you can see in the screenshot. ...and click on 'Copy Here'. It is just as easy as dragging and dropping on any GUI-based system. Now, if you look at the directories, you can see that the whole structure, including subdirectories and files, has been copied across to the server. Unfortunately, this does not work on every browser. This was done on SUSE Linux 8.2 professional and I know that it also works on KDE on OpenBSD 3.5. If you find that you cannot get it to work, you could try the following or failing that, do it manually with the command line version of FTP. If your browser does not support the behaviour displayed above, you can get around it by installing an extension in FireFox. In the dialogue box that appears, click on 'Get More Extensions'. A new browser window will appear (unless you have configured new browser windows to appear as a new tab instead) and in the top right, in the search box, type 'ftp' (no quotes). Click on 'Go'. Part way down the page of results, you will see 'FireFTP'. Getting you to search for it rather than giving you a URL or a file ensures that you get the most up to date version for your browser. Click on the 'FireFTP' link in the title (here 'FireFTP 0.94.2'). This will take you to the add-ons page. ...and your extension will download. Now, you have FireFTP in your list of Extensions. You will now have to close FireFox and re-open it. With it reopened, you can see that FireFTP is in the menu. You can click on it here each time you want it or you can install it as an icon in your browser tool bar. Right-click on the tool bar and select 'Customise...' (yes, with an 's'. Firefox can get their localisation right so why can't Microsoft?). You can now drag it to where you want on the toolbar and then click on 'Done'. Now, FireFTP has its own Icon. When you click on the FireFTP icon (or choose it from the tools menu) you will get a page like this. Type in your details - if you want, you can try this out on a local FTP server on your LAN if you have one. Click on 'Connect' (just to the right of where you clicked to enter your account details) and it will initiate an FTP session with the remote server. You can see at the bottom of the screen the transactions as they take place. To transfer files and/or directories to the server, just highlight them and drag-and-drop them into the file list on the right. If you want to delete a file or directory, just highlight it on the server and delete it. You can use the green arrows in the middle to copy highlighted files instead if you want to. Once you have finished, click on 'Disconnect'. Whilst Windows now comes with its desktop firewall turned on by default, there are still some bad default settings that they should really do something about before they release the final version of Vista. One of these is the 'Hide extensions for known file types' option being turned on by default. There is no reason why this option should even exist. I can't envisage any scenario where a user that is old enough to use a computer is going to burst into tears because they can see that their file's name ends with '.txt' or '.png'. Microsoft: file extensions don't get in the way and they are useful, so get over it. The special case (or 'only excuse') is the desktop which is the only explicitly graphical part of the system. Even on KDE, desktop links end with '.desktop' (eg, 'Floppy.desktop') and are the only hidden extensions but only on the desktop - if you look at the desktop directory using a command line directory listing or in a file editor, you will see them. However, Windows hides all file extensions that it recognises throughout the system, regardless of where or how you see them using the GUI - although you can still see them using 'dir' in the command line. However, hiding extensions provides plenty of opportunities for files with malicious content to misreport their content. We quite often see examples of email attachments where the file has, for malicious reasons, a double extension. For example, with extensions hidden, notes.pdf.exe will be displayed as notes.pdf - a normally harmless portable document file (unless you use NTFS where even the file content doesn't mean that there isn't an executable file that will run when you start any given file) - but the system will know that when it is opened, it should be executed and not simply passed on to Acrobat. Examining the first few bytes of the file reveals that it starts with 'MZ' instead of '%pdf' and is therefore an executable but the user that is clicking on what he thinks is a PDF file is really starting a program that will be awarded his/her rights. ...and click on the 'View' tab. Next, in the 'Advanced settings:' list box, make sure that the 'Hide extensions for known file types' check box is unchecked. Click on OK and so on and they will appear. Anybody who has used Windows for any length of time will be familiar with the 'Blue Screen Of Death' (BSOD). There have even been screensavers in other operating systems that mimic various types of BSOD from Windows 95 through to Windows XP. However, in Vista, they might have changed their looks slightly - they now tell you more about what has happened and for a few seconds, you can glimpse into the tangled web that lies just below the surface - but they still happen. Now, when you reboot, you can again see what happened and even check online for a solution. At the time of writing, blue screens happen repeatedly when switching from one user to another, going to sleep or even just logging off. Like most BSODs, it is intermittent. Repartitioning programs are usually quite good but normally require an operating system to be running so that they can run - one exception to this being Acronis Partition Expert ( http://www.acronis.com/ ) which puts itself in a separate partition and runs from that. However, if your OS won't even start because a disk is full, you are in trouble. So, how does the disk get full in the first place? When installing new software on Windows, everything likes to install on the C: drive. Some programs give you the option of installing on other drives but largely, you don't get the option. So, no matter how good your intentions at making sensible partitions for Windows, C: soon fills up and Windows won't boot. So, once you have backed up your data (use KNOPPIX to do this - this has been covered a number of times before), you can start deleting partitions. You can use the Windows partitioner that appears at the start of the Windows installation (on the right) but that's quite basic and if you want to know existing partition formats, don't bother with this as it is Windows only - 4.2BSD, ext2, ReiserFS, you can forget them all. If you want a knowledgeable visual representation of your partitions, keep the KNOPPIX session running. qtparted - this being a GUI version of a partitioning/formatting program that is fairly easy to use. Make sure that the partitions you want to delete are there as read/write and the rest is pretty self explanatory. Once you have your partitions deleted, just create one big one for Windows (and any others that you might want for anything else in the future). When you reinstall Windows, it will format it for you in whatever it feels is appropriate.